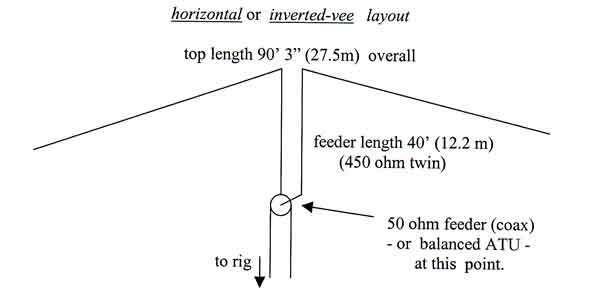 This is the antenna for you guys who want to get on HF effectively, and haven’t too much space or cash to throw around. Actually, it’s a design from ZS6BKW (aka G0GSF), similar to the G5RV, but it actually resonates on five bands, (well 6, actually) and doesn’t rely on a tuner (ATU) to make it work. The design appeared in TT (RadCom) Jan & Feb 1993, but is also in Pat Hawker’s “Antenna Topics” (publ. RSGB 2002) It’s only 90 ft long (27.51 metres), with a 40 ft (12.2 m) downlead. So, it’s a cousin to the G5RV (which only resonates on 14 & 24 MHz), but better as it needs no ATU on 40, 20, 17, 12, 10 and 6 metres. When Telford DARS were doing the 50MHz Trophy contest down at Bridgnorth, I took the necessary bits along to try out this antenna. For simplicity, I set it up as an inverted-vee configuration. The reason was simple – you only need one support to hold it up, not two. I also had the club’s MFJ Antenna Analyser with me so that I could see what was happening. I recorded the data – see below. Incidentally, all centre fed antennas can be supported by just one mast, with the ends left to droop down. The ‘rule of thumb’ is that the angle at the apex should never be less than 90 deg, otherwise cancellation between the two halves occurs. Furthermore, as it is the current peaks along an antenna that do most of the radiation, having the centre at the highest point is a positive advantage, rather than supported at each end with a big droop at the centre (current point nearest to ground). This is another reason for not being too fussy about the ends of a centre-fed antenna being lower, or bent around. It will have minimal effect on radiation efficiency. The only thing is never have the ends dropping right down to ground level – because the ground will seriously de-tune the antenna and it will not work – believe me, I’ve tried it. Just a yard or so off the deck makes all the difference. Simply have end insulators (or plastic strips etc), then wire or twine to the tying-off points. This effectively raises the ends of the antenna sufficiently clear of the ground. So, the ‘BKW can be horizontal (two supports) or inverted-vee layout (single support), as shown. Incidentally, the same applies to a simple dipole. The antenna wire can be solid copper, stranded, insulated or not. A lot of rubbish is printed about the merits or otherwise of different sorts of wire. It’s largely hogwash. Wire is wire at these frequencies. Wet string ? …… well that’s a different matter…. Finally, if you want to use it on other HF bands (3.5, 10, 21 MHz), an ATU (just like at the bottom of your ‘5RV !) will do the business, but preferably at the bottom of the 450 ohm feeder with a balanced output, not after a length of 50 ohm coax, if you’ve had to use it to reach your rig. Of course for 1.8 MHz (160m), you could short out the feeder twin, and feed it like a Marconi antenna, with a suitable ATU. Not very clever, however. 28.62 MHz (10 m) 1.3:1 60 No sweat! 50.27 MHz (6 m) 1.3:1 60 A surprise: 6m. too!